The Phoenix School’s 6th-8th graders recently got back from the Florida Everglades and have spent the last two weeks going over their research and discussing what they had learned on the journey. Since the Kindergarten through fifth graders had also completed a similar imaginary journey, the two groups were able to share notes and discuss their findings. There was much debate about who really had the better time. There is no debate however that the actual trip to the Everglades itself was an exciting adventure for all involved, especially for two students James (7th grade) and Emma (6th grade). Throughout the week the students rode bikes through Shark Valley, canoed through the mangroves, explored wild Anhinga trails, navigated into Cypress domes on a slough slog, and kicked back at the Hoosville Hostel in Homestead. “The first night we were there, even before we went to the hostel, we stopped at Anhinga Trail,” James explained. “It’s this really beautiful space with a boardwalk where you can see Anhingas. Each student had a chance to walk to the ends of the boardwalk by themselves, which was really creepy because you could hear the little slaps of the tails of fishes on the water as you moved. “But every so often you would hear a much larger slap on the water, and those were the alligators,” he added. The next day, the students met up with Christopher Kavanaugh, a marine biologist for the Everglades ecosystem who talked to the kids about the salinity of Florida Bay and the impact of boat passage through the delicate environment. Another exciting part of that week was a 2.5-mile kayak trip in Flamingo right next to Florida Bay. “We didn’t see much on the way up there,” James remembered, “we were just kayaking. Then on the way back, the incredible things started to happen. Emma (6th grade) found the bike trip to be especially interesting because this was her first time doing something like this. “On the bike trip, I couldn’t believe how easy it was. I didn’t fall one time. Now I know what people mean when they say ‘It’s as easy as riding a bike,’” she said. During the trip, the students also had to be wary about accidentally running over the local wildlife. “Here pedestrians get the right of way, there, the alligators get the right of way,” James explained. The classroom was full of the hustle and bustle of children shuffling quickly through a makeshift security line. “Take off your shoes and your belt and put all of your personal belongings in the bin to go through the scanner,” one fifth grade student said to a third grader in line. “Don’t forget to empty out all of your pockets,” he added as an afterthought. This past week, the students at the Phoenix School took off to the Everglades, and while the 6-8th graders took the actual physical trip to Florida, the Kindergarten through 5th graders created an imaginary journey where they would re-create every aspect of what it would be like to take such a trip. While the older kids were off exploring the mangroves of Southeastern Florida, the fifth graders at the Phoenix School were the ones left in charge. It was up to them to design a trip that would get their fellow classmates (and flight passengers) to their final destination safely and securely. In doing so they were able to make use of the social, emotional, and leadership skills they’ve gained over the course of the year and incorporate it into a week of imaginary travel. While they were handling all the main details like flight paths and deciding which was the best route to take through the mangroves, the younger kids engaged with their environment by experiencing the imagined journey, taking notes on their findings, and doing research projects to prepare for the trip. Throughout this process, they also engaged with fundamental learning techniques like writing, working with numbers, and logic, but in a way that allowed them to use their own personal learning style in real-life scenarios. Once all the students passed through security and took their seats aboard the plane of the imagination, the fifth-grade captains made announcements over a pretend loudspeaker. The screen in front of them played a Google Earth Flight Simulator depicting the view of the runway. “Welcome aboard flight 406 to Fort Lauderdale,” the first captain said. “Please buckle your seatbelts for takeoff and make sure that all of your personal belongings are in an overhead bin or tucked under the seat in front of you,” the second captain said. The plane started to take off in a wobbly fashion, causing the passengers to giggle uncontrollably. “Please don’t worry, we are professionals at this,” the third captain explained with a laugh as the simulated plane rose higher into the air. “Let’s do a barrel roll!” Someone yelled from the back. Although these questions may not be great for the development of the Anhingas, they are incredible for the development of the students, and of the course of the week of imaginary travel, they will have had an experience and stories to swap with the 6-8th graders returning from the real alligator alley with tales of their own. 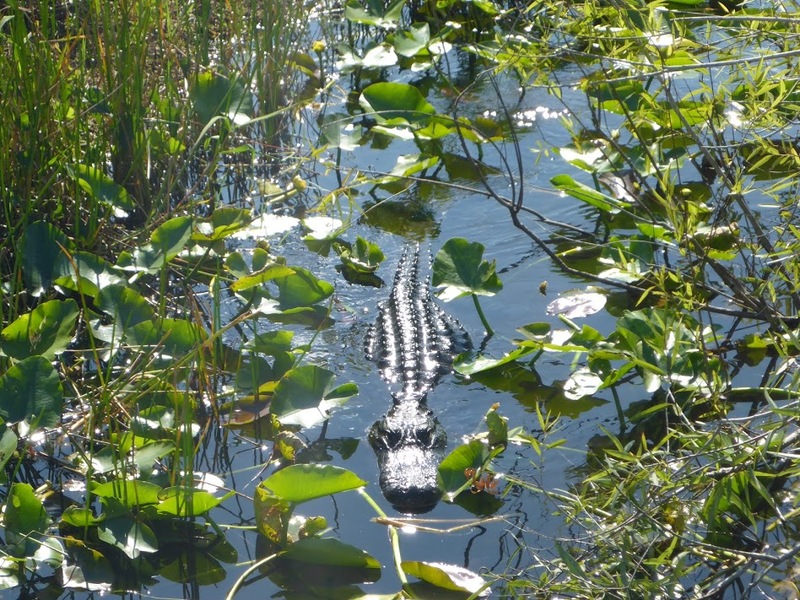 Stay tuned for next post when we share stories and photos of the older kids’ adventure to the Everglades.